Organize and archive inter office communication between dental employees with the Dental Practice Pro cloud based employee communication software. The Success of your dental business is measured by your staff’s commitment. 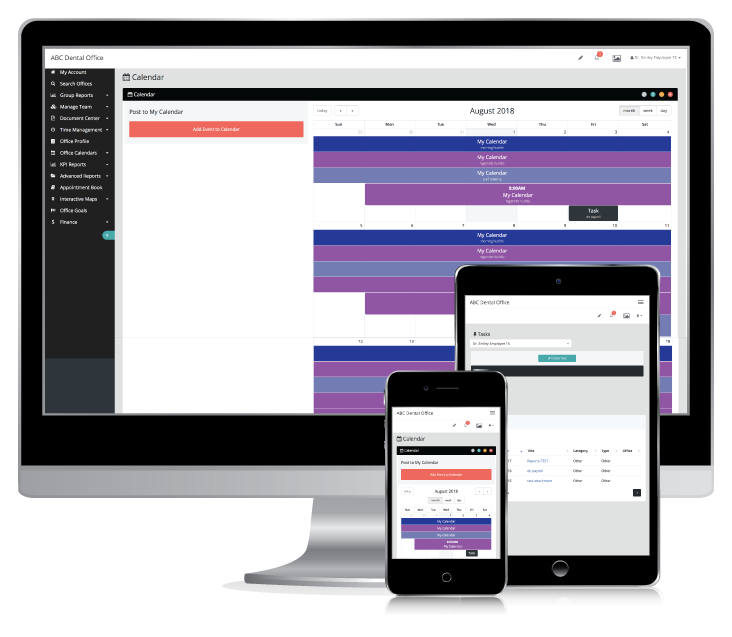 When delegating employee tasks, scheduling staff meetings or setting task deadlines, our custom calendars helps dentists and dental office managers coordinate their dental team, while maximizing time and efficiency. Experience Online Interactive Meeting Calendars that can be viewed on any device! Maximize your dental staff’s time and productive involvement in the development of your business utilizing our employee communication software and online tools. Maintain your dental organization’s culture by creating an ongoing structure of events and meetings. Dental Practice Pro’s employee communications management software applications allows your employees and dentists the ability to easily share information, schedule meetings, follow up on tasks and increase efficiency and streamline communications processes between staff departments, locations and external parties.